Bread lovers unite for these stuffed breads that make a meal. Featured here are recipes for a few of our favorite stuffed breads that you will stuff and then they will indeed stuff you. You’ll find our stuffed Spaghetti Bread, stuffed Pretzel Dogs and stuffed Bread Soup. They all make a great presentation to the eyes and the belly. Not just a sandwich for dinner, but a meal totally encompassed by warm wonderful bread. No side of bread needed to complete this picture! 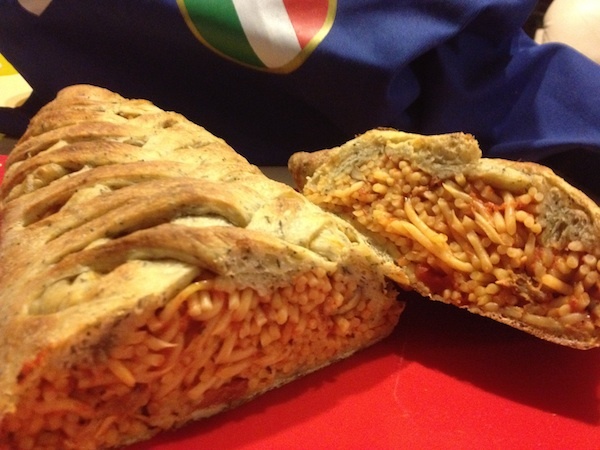 Ingredients for stuffed bread spaghetti are simple : spaghetti, spaghetti sauce and pizza dough. This one looks amazing when presented, but it’s not really that difficult to make, especially if you cheat… We went with ready-made ingredients and ended up with a great homemade taste. We started this one with a package of Trader Joe’s herbed pizza dough, sold in their refrigerator section. You open the package and let it rise for 20 minutes while you cook the spaghetti. We chose their herbed pizza dough to wrap the red sauce spaghetti and then we made a second one with their plain pizza dough and wrapped up spaghetti with pesto sauce and chicken. Either make or un-wrap some fresh pizza dough and allow it to rise while making the spaghetti. Boil some spaghetti according to package directions for “al dente”. Drain well the spaghetti and then toss in a jar of your favorite pasta sauce (use just enough sauce to coat the spaghetti). We used a Marinara sauce and then chopped up some leftover roast pork and threw it into the mixture. Toss & stretch the dough until thin and then place onto a baking span sprayed with a little oil. Spread the spaghetti and sauce mixture onto the top of the prepared dough in the center. 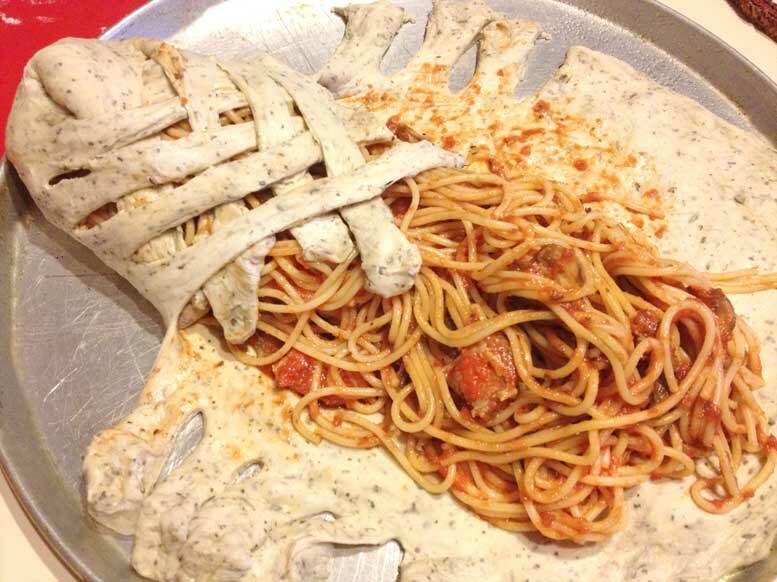 Slice the dough edges (beyond the spaghetti pile) diagonally as shown above then criss-cross the cut edges across the top of the spaghetti mixture. Bake at 350° for about 20 minutes (or until browned). Slice and serve while warm (but can also be eaten cold). 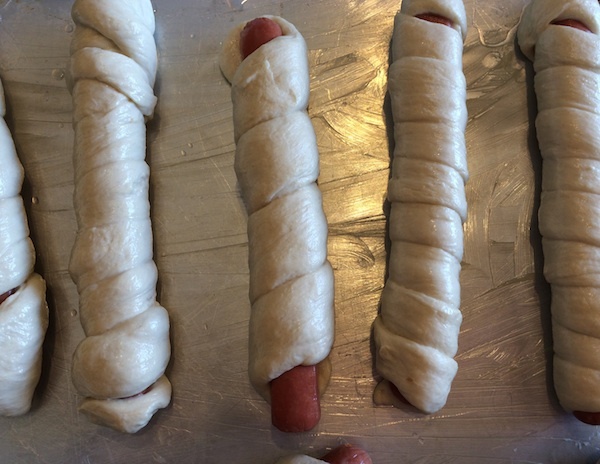 These pretzel dogs rival Auntie Anne’s Pretzel Dogs for sure. They are easy to make and easier to serve. But, if you are making a lot of them you will want to elicit a buddy to help because the rolling does get rather tedious after a few batches. Think we’re crazy making several batches at once? Wait till you taste them and you’ll know why we wanted dozens. Plus, they freeze beautifully so you’ve got a quick meal in your hand anytime you want. The other reason is that they are also more fun to make in pairs, a good date dinner. 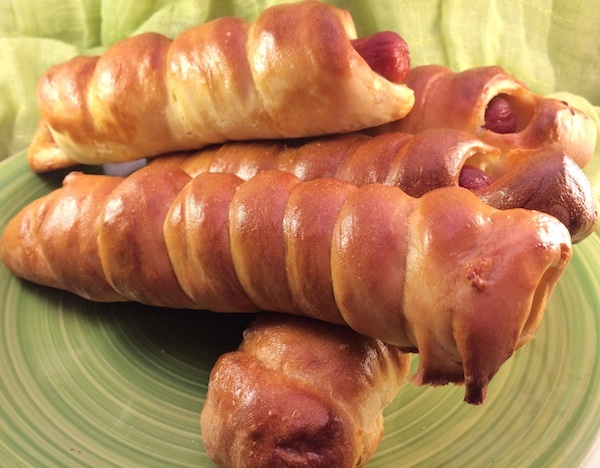 If you love Auntie Anne’s Pretzels and hot dogs, you will love these Pretzel Dogs. 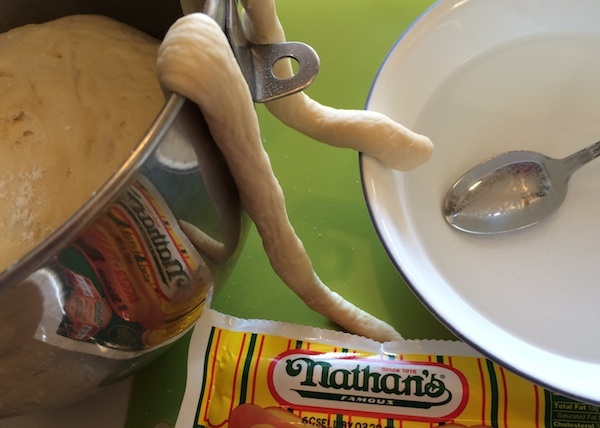 You probably already tried one at Auntie Anne’s at some point, but seriously you can make enough to feed the family for less than buying just one. That is if you time it right, our grocery chain puts Nathans hots on a BOGO sale every few months so that makes 8 of these cost around $4. Pretzel Dog Ingredients: Yeast, Salt, Water, 2Tbs Brown Sugar, 4 Cups Better for Bread Flour (or, 2C Bread Flour and 2C regular Flour), Nathan’s Skinless Hot Dogs (be sure to buy this brand, you will be sorry if you try to cheat here and use another brand). That’s it for the dogs, then you will need 2 Tbs Baking Soda for the bath before baking and about 2 Tbs melted Butter for brushing the bagel dogs after baking. Sprinkle 2&1/4 tsp active dry Yeast (or 1 pkg) into 1&1/2 Cups of lukewarm water (110°-120°). Make sure the water is warm to the touch, but not hot. Stir to dissolve then let sit for 5 minutes. Add 2 Tablespoons of Brown Sugar and 1&1/4 teaspoons of Salt and stir. Add 4 cups of “Better for Bread” Flour. 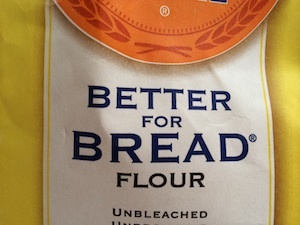 If you don’t have this flour, you can use 2 cups bread flour and 2 cups all purpose flour. 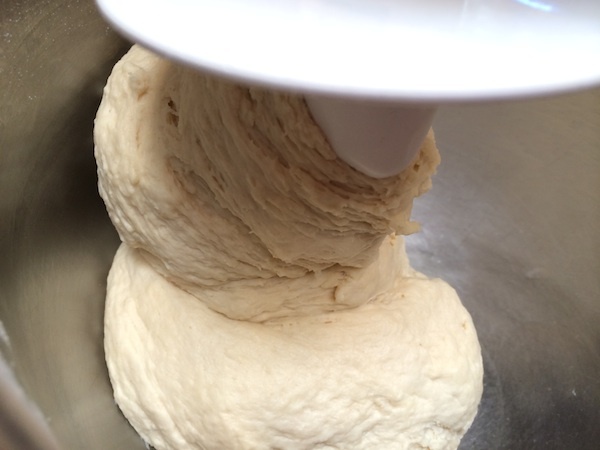 Knead until soft and elastic (the dough will work its way up & down your hook). Let the dough rise uncovered for at least 30 minutes or more. 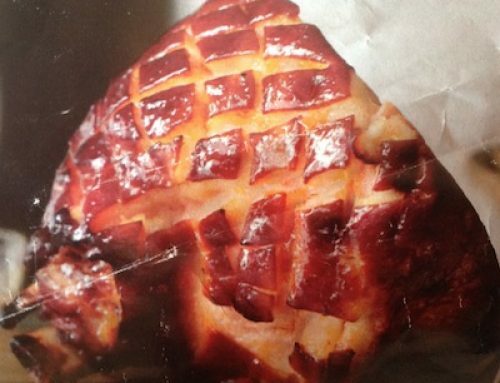 Grease a baking sheet with Crisco or butter. Fill a bowl with 2 Cups of Warm Water and 2 Tablespoons of Baking Soda. Stir. Pinch off some of the dough (put a little bit of flour on your fingertips first) and roll it into a long thin rope about 12-16 inches long. Dip the rope into the baking soda water and then roll the rope around the hot dog. Allow the dogs to rise again after being rolled, about 20-30 minutes. Bake at 450° for 10 minutes (or until golden brown). Brush with melted butter and sprinkle with salt right after removing from oven, if desired. Dip in mustard, ketchup or melted cheese for a warm satisfying meal. One batch of dough makes 8 long hotdogs and there’s enough dough left over to make some cinnamon sugar pretzels for dessert. Make the same rope only thicker and then cut it into sections. Bake as directed for the hot dogs but after baking and brushing with butter sprinkle with a mixture of cinnamon and sugar. 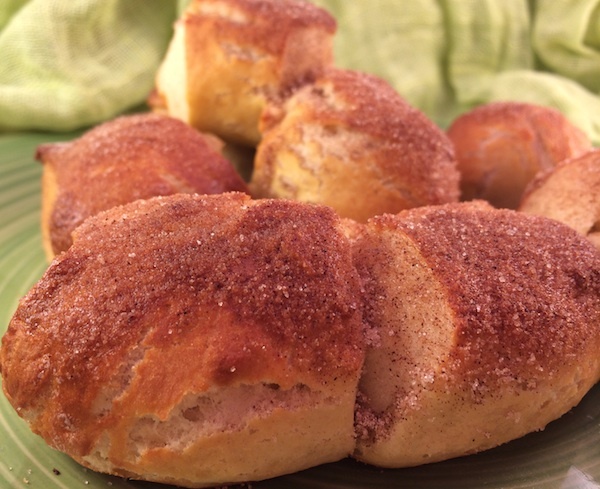 Dinner & dessert from one batch of dough! 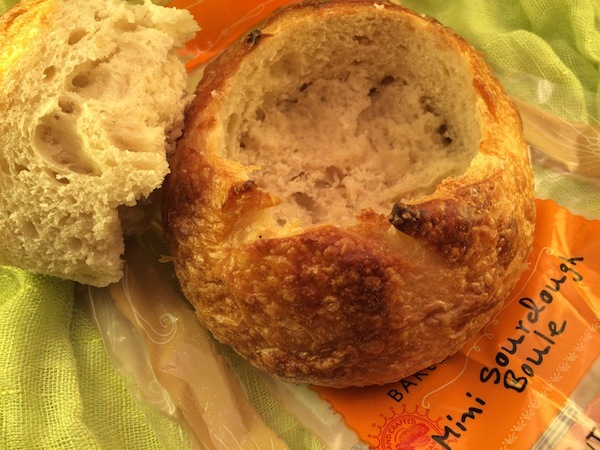 If you’ve ever been to Panera Bread or Boudin Bakery, you’ve probably had a bowl of fresh hot soup served in a round bowl of bread. You probably also saw a lot of bread bowls in the trash can. It’s a lot of bread for one person to eat in one siting, and it’s difficult to eat without either getting it all over your face or breaking plastic silverware. We’ve tried bringing the leftover bread home, but it was so mushy by that time that the appeal was gone. So, we decided to start making them at home. That way, we can cut the loaf of bread in half if we want. 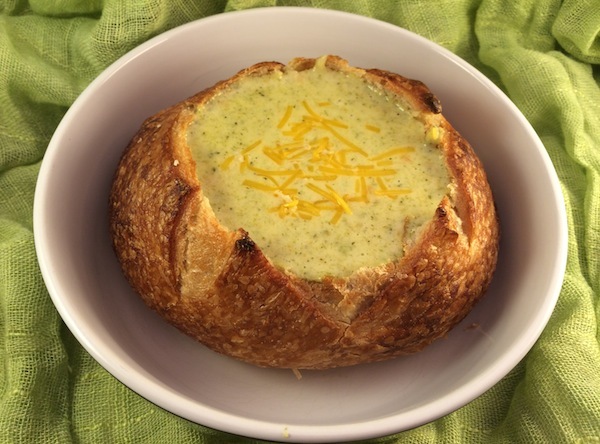 Sometimes, we fill the bowls with a can of New England Clam Chowder, a best seller at Boudin Bakery, and sometimes we make Broccoli Cheese Soup, a best seller at Panera Bread. Although we prefer the combination of clam chowder with sourdough, this soup is pretty tasty on its own. Melt the butter in a large Dutch oven or heavy pot on medium-low heat. Add the chopped onion and cook (about 5 minutes) until tender. Whisk in the Flour until golden (1-2 minutes). 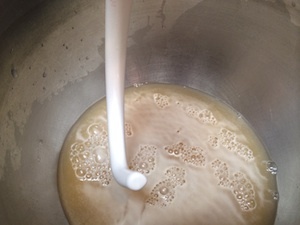 Whisk in the milk & cream (or 2 cups half & half) until smooth. Add the Chicken broth, Bay leaves, Nutmeg, salt & pepper. Reduce heat to low and simmer uncovered until thick (about 20 minutes). Add the Broccoli and Carrot to the mix and simmer until tender (about another 20 minutes). Prepare your bowls at this point. [Depending on which bread you’ve bought and how fresh it is you may want to bake your bread (we like to heat ours regardless) . We sprinkle it with a little water and place it in a 350° oven for about 10 minutes until the crust gets crispy.] Take a sharp (pointed) serrated knife and cut a circle in the top of the bread while angling your knife toward the bread crust and cutting in a circle just to the bottom of the loaf (but not through!). Stick your fingers in there and pull the circular cap from the bread leaving a large cavity for the soup. You can do what you like with the center of the bread… butter & eat it, serve it alongside the soup for dipping, make bread pudding for dessert or a french toast casserole for morning. Discard the Bay leaves and blend the soup until smooth (just flecks of broccoli & carrot remain). An immersion blender works well or you can pour the mixture into your blender (you will have to do a few batches as to not overflow your blender) and then back into the pot or just whisk like crazy. Add the cheese to the soup and whisk over medium heat until melted. Scoop into the prepared bread bowls, garnish with more cheese and enjoy! 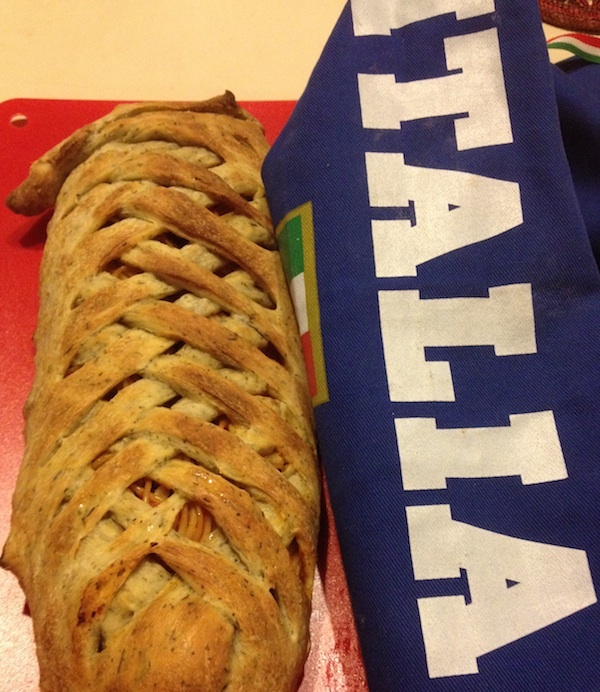 If you prefer your bread stuffed with cheese, you might want to try our rosemary bloomin bread. To find out how long spaghetti lasts visit our pasta page. To find out how long hot dogs last visit our hot dog page. To find out how long canned soup lasts visit our canned soup page.